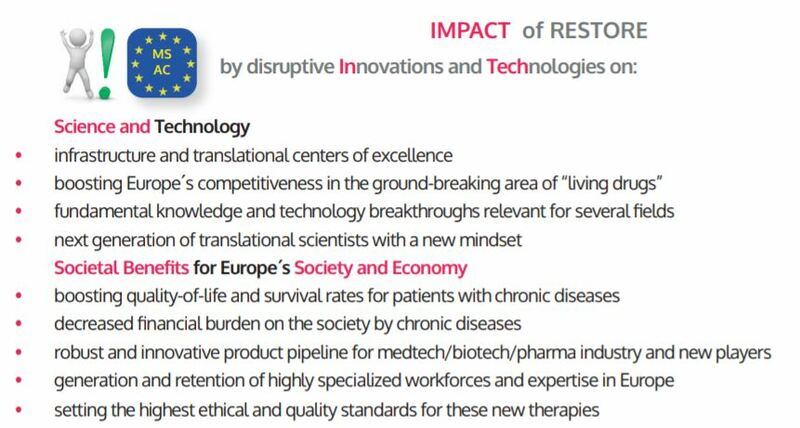 Shifting from treating symptoms to curing chronic diseases by making the transformative promise of Advanced Therapies a reality for the benefit of patients and society and by making Europe a spearhead of Advanced Therapies in Science,Clinics and Biomedical Industry, that is the vision of the international project RESTORE Health by Advanced Therapies, coordinated by the Charité Berlin & Berlin Institute of Health. WHY DO WE NEED RESTORE ? The increasing prevalence of chronic diseases and multi-morbidity due to demographic factors represents a high socio-economic burden for Europe. The direct health costs increased by 50% during the last decade and reached €1.526 bn in 2017, a staggering 9,6 % of Europes GDP (EU Health at a Glance 2018). As current therapies rarely cure, but merely fight symptoms, never-ending treatment is required, which means diminished quality-of-life, adverse effects and soaring cost for society. There is a high need to reach sustainable improvement for patients or even to cure them of chronic diseases – in other words, to disrupt the paradigm of “treating symptoms” with “restoring health”. Advanced Therapies are the game changers that open up transforming therapeutic opportunities. Advanced Therapies, in Europe categorized as Advanced Therapy Medicinal Products (ATMP), are often referred to as “living drugs” and include cell & gene therapy products and tissue engineered products, as well as the combination of these products with medical devices such as biomaterials. They are often produced specifically for individual patients (personalised therapies) but if feasible also as off-the-shelf products (a product derived from one donor for many patients). In their manufacturing, clinical use, and mode-of-action they are characterized by a high degree of complexity compared with conventional drugs or antibodies. For genetic diseases, immune diseases, cancer and tissue injury potential cures through Advanced Therapies exist- it is reality, not fiction. Some products are already on the market, mostly for rare diseases which means only a few thousand patients worldwide have benefitted from Advanced Therapies until now. Why are there so few Advanced Therapies implemented in clinical routine so far? “Living drugs” are a disruptive innovation that challenges the “tried and tested” paradigm of drug development at almost all Technology Readiness Levels . At the advent of such a trail blazing change, obstacles and roadblocks abound. The recently approvedAdvanced Therapy products required a long and costly added-value chain (>20 years) and the complex manufacturing and clinical development results in high product prices. Advanced Therapy development is driven by academia and smallbiotech (a new phenomenon in drug development), although Big Pharma steps in now. The pace of progress has accelerated over the last few years, notably in the US and Asia. Europe lags behind despite its high innovation potential and demonstrable successes in the past. Therefore, there is a need for a focused, determined and well-funded large-scale research initiative in Europe – that’s the motivation to found RESTORE. WHAT is RESTORE aiming at? • Establish a well-funded consortium with a long-term perspective that is backed-up by the scientific community from Life, Social and Economic Sciences,relevant stakeholders,patient advocates and the public and is building on the 3Ts: Transdisciplinarity, Technology, Translation (to patient care). • Accelerate and de-risk the development of Advanced Therapies by implementing the Research&Technology InnovationPlatforms (one tool-many applications), and the Refined Translation Tool(iterative improvement by learning from success and failure) at academic hubs. • Form the RESTORE consortium as the docking point for Biotech/Medtech/Pharma industry and special interest venture funds and embed RESTORE into international networks. • Attract funding for dedicated infrastructure(academic hubs),open-calls for the Research&Technology Innovation Platforms (from early product development to pivotal clinical trials and implementation into clinical routine), Cross-Topic Platforms (smart manufacturing 4.0, health-economics) and the Coordination & Support Activities of RESTORE (coordination and communication, specialist training and workforce development, ethics, international networks, central data management, patient advocacies…). 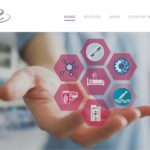 The RESTORE Core Team are a formidable group of 10 partners from academic centers and biotechs with excellent international reputation and a strong track record (Charité/BIH, Univ. Zurich, Catapult CGT, TissUse, Pluristem, Miltenyi Biotec, INSERM/Univ. Paris Saclay, InnActa, Fondazione Telethon,Univ.Minho). The Core Team and their close to 300 committed supporters from 26countries (EU-MS,EU-AC,USA,Singapore) form the RESTORE community. Please visit the RESTORE website (www.restore-horizon.eu)for more details on the activities,follow us on Twitter and Facebook, and JOIN US!